The Blue Mosque, the Ardabil Carpet, and the Taj Mahal all date to this important period. c. 1517 - 1924 C.E. Producing this lush miniature involved many Persian artists—and likely some familiarity with Chinese sources. These tiny pieces of precious metal contain a wealth of information in their Persian and Arabic inscriptions. The sound of the fountain led guests into this 18th-century house, where a vibrant interior stimulated ear and eye. This mosque was the crowning achievement of architect Sinan’s career and a trophy of Ottoman imperial grandeur. 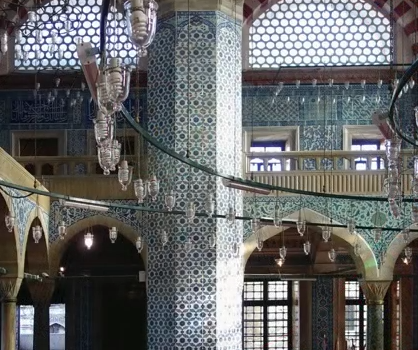 Unlike other of Sinan’s mosques, this one is covered with tiles, sits above shops, and is accessed from a stairway. Two famous lovers meet in this miniature—as do Persian and European painting traditions.